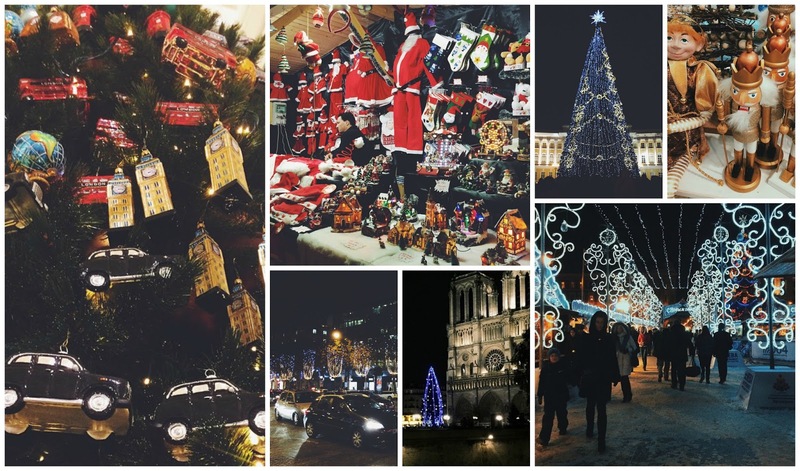 Whether you chose to celebrate Christmas in the most romantic city of all - aka Paris - or decided to travel to Mother Russia to spend holidays in my hometown of St. Petersburg, I've got you covered! In this article I'll be sharing my top places to go to in both cities and things to do to enjoy the festive atmosphere and make some wonderful winter memories that will last way longer than the fluffy white snow. If you're spending the days leading to Christmas in the capital of France, you absolutely have to go to the market located on Champs-Elysées (14th Nov - 4th Jan). It is overflown with goods produced in China, yes, but the atmosphere is still very cheerful and uplifting there with all the people smiling, eating waffles and drinking mulled wine. If you know who Patrick Chan is (if you don't, I order you to watch this video asap because you're missing out! ), let me hug you and invite you to put your skates on and learn how to spin at the giant rink in front of Hôtel de Ville (18th Dec - 1st Mar). For those that don't mind going on a splurge, Disney's Christmas (7th Nov - 7th Jan) is just what the doctor ordered. In case you'll be in St. Petersburg before New Year's Eve I recommend visiting the traditional outdoor market at Yelagin Island (19th Dec - 11th Jan; go on a snowy day and be ready to hit the ice! ); the indoor BonMarché design market at the Artist Shop (19th-20th Dec; lots of workshops and French food); and the Christmas Charity Market that will take place on the third weekend of December at the abandoned Annenkirche church (handmade souvenirs, Christmas choir and your chance to take a cheesy selfie with Mr. Claus). As I already mentioned, nothing can beat strolling along Champs-Élysées during the holiday season when all the trees are sparkling and glistening. However, it's far not the only place to marvel at the Christmas lights: try rue du Faubourg Saint-Honoré, place Vendôme, avenue Montaigne and rue Royale. The prettiest Christmas trees are to be found inside Galeries Lafayette and in front of Notre-Dame - by the way, last year's tree in front of the cathedral was installed thanks to Russia that was kind enough to donate a 20 meters tall beauty to France. Our countries are true BFFs! Speaking of festive illuminations in St. Petersburg, the place to go to is of course Nevsky prospect, the main artery of the city which this year will be turned into a fairy winter garden thanks to more than 200 colorful LED-garlands. The tree at the Palace Square will as usual be the center of everyone's attention - for a few years now it is a faux one which is a little disappointing, but it is decorated with more than 20 tons of silver and golden baubles and that is pretty amazing if you ask me. My favorite place in Paris to shop for Christmas ornaments is hands down Le Bon Marché Rive Gauche. Last year's selection dedicated to insects and traveling blown me away, and if only I could've taken them all with me, I would've, rest assured. Another favorite of mine is SIA Home Decor at 5 Boulevard Malesherbes - sophisticated and chic, just the way we want our homes to be in the midst of the holiday frenzy. If you're in St. Petersburg and looking for the most elegant baubles and Nutcrackers to give your friends or yourself, I suggest checking out the annual holiday bazaar at DLT | TSUM Department Store. It is becoming a tradition of mine to get one very special ornament there each year, plus the merry-go-round they put up there this time will make your friends double tap your photos on Instagram all day long. For cheaper options, I recommend OBI hypermarkets that stock some seriously pretty stuff - and by that I mean feathery light Eiffel Towers to put on the tree and gracious sparkling reindeers. Sadly, my family doesn't have many traditions, but the one we all look forward to every year is movies on the 1st of January. As some of you may know, since most or Russia's population is orthodox, Christmas is celebrated here on the 7th of January and it does remain a very religious holiday. Therefore for us the excuse to stock up on gifts, drink champagne and wear fancy dresses is in fact New Year's Eve! The vast majority of my fellow countrymen wakes up around 2PM on the 1st of January and after eating leftovers for breakfast stays home and watches telly as most of the places are closed. My family, however, goes to the local cinema and watches a brand new Russian movie - this year we're thinking "Wonderland", although I'd prefer "Steve Jobs" (because OSCARS!). How do you celebrate winter holidays and what are you family's most cherished traditions?